It's been awhile since I shared a DIY, and a cheap one at that! 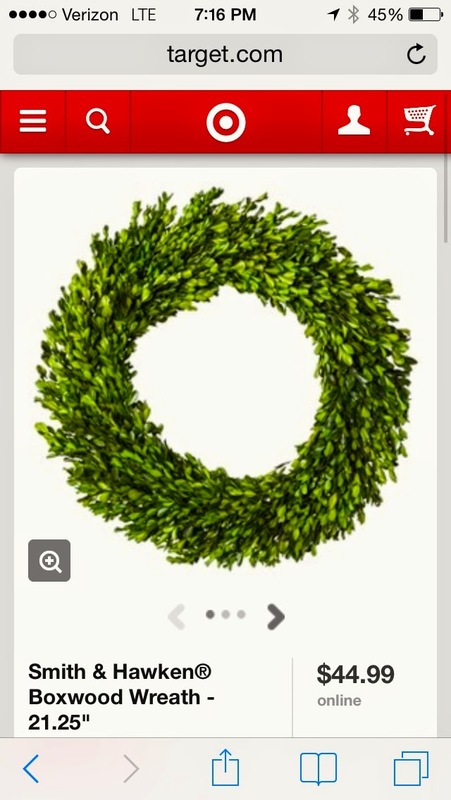 I was on Target's website a few months and was looking at their Smith and Hawken Boxwood Wreath. It was absolutely gorgeous and something that I was crossing my fingers that we would get off of our registry...but we didn't. Here is the lovely beauty. After trying to do our registry completion at Target, I realized that there were a few more important things that we purchased initially and that I probably wasn't going to get the wreath that I wanted, for $45, might I mention. Ahhh! However, I really, really wanted one for our new apartment. Which...led me to doing a bit of do-it-yourself research. We all know that you can learn how to do almost anything between Pinterest and Google, so I started researching. I ran across these amazing tutorials on House and Hone and Newly Woodwards, which inspired my plan. I made a quick phone call to my always dependable mother to see if I could take one a few of her boxwoods in her front yard and did a bit of research online for a grapevine wreath. After calculating what I saw online, I figured my wreath would cost be around $10. However, a quick trip to Walmart found me with $5 grapevine wreath, which I was stoked about. Here are some pics and a few steps. 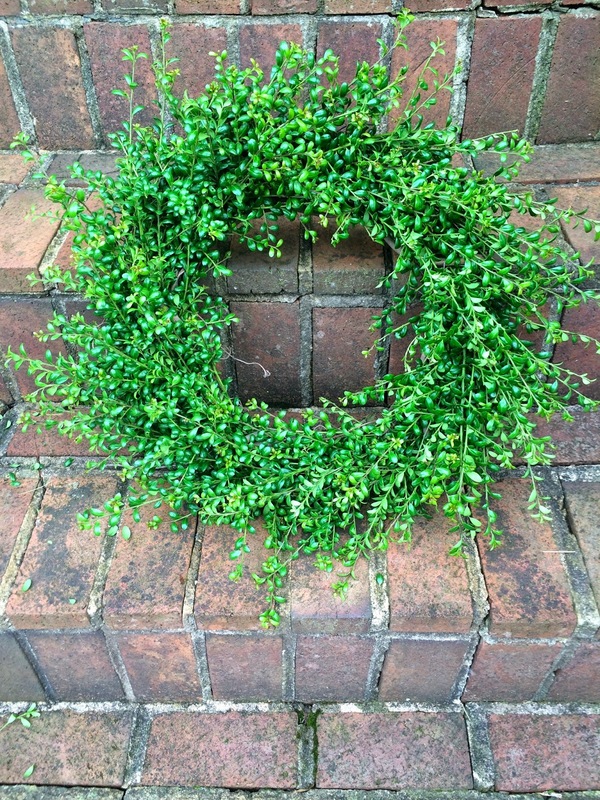 Some blogs mention gluing the stems into the wreath. I didn't have enough patience for that part, but you might want to try it! I was so excited to begin placing my wreath together initially, that I wasted a lot of time snipping little branches and then placing them in the wreath. Wisdom told me that it would be faster to just start snipping and to place the boxwood branches after I had a nice pile, which is exactly what I did! 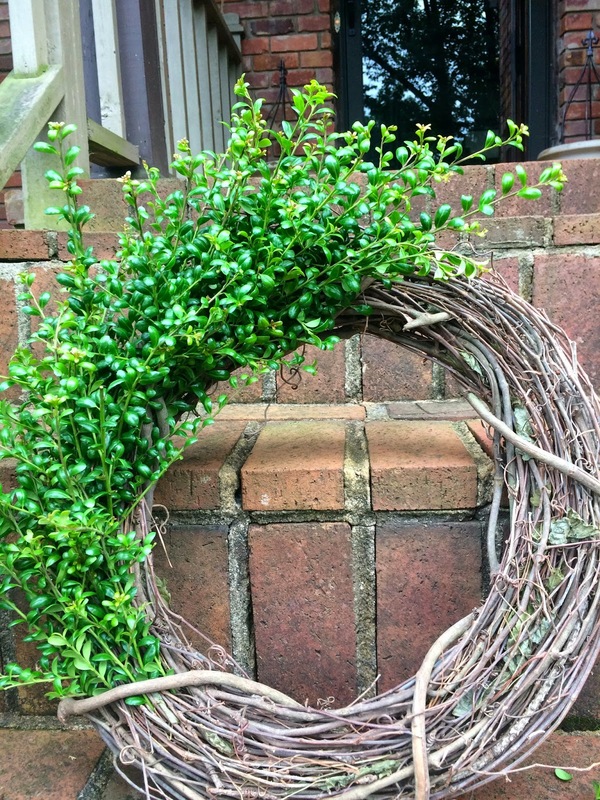 After I snipped a good pile of branches, I started placing them around my wreath. I tried to fill in around the edges and to keep the leaves on the boxwood all facing the same direction. Thankfully, I had a very snug grapevine wreath, which held the branches without any gluing needed. It took me about an hour to get all of the branches in the way that I wanted them to look. After I was finished, I couldn't wait to get it home and hung up at my house. 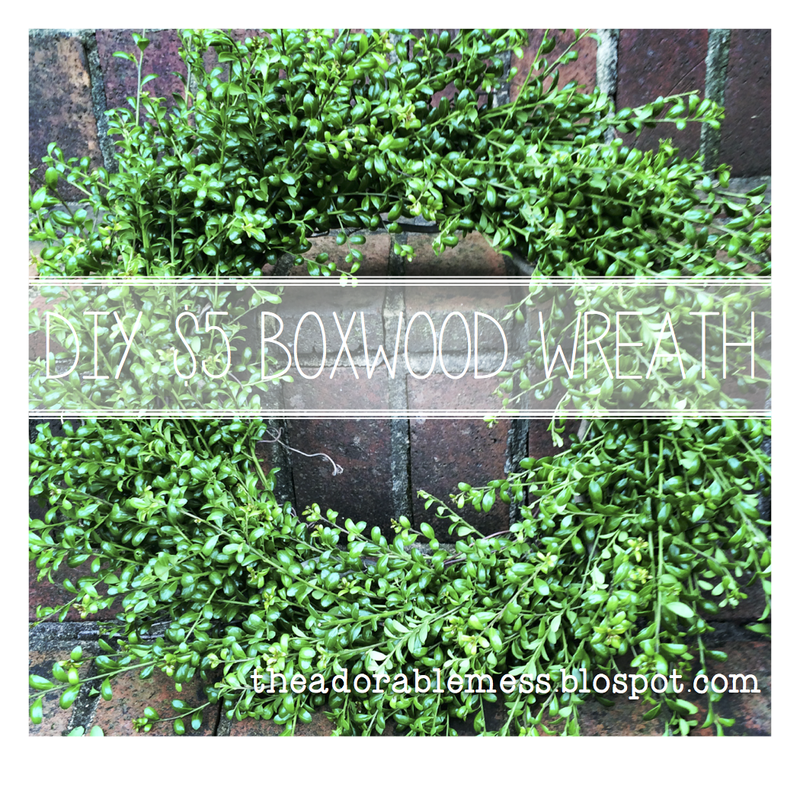 I've read that boxwood wreaths can last awhile if you keep misting them with water. I'll let you know how it holds up! My finished product! I just love how bright green it is and the whimsical nature of it. What I REALLY LOVE is that it looks as good as the Target wreath and that I only spent $5. Win.